Aqua Rite Pro is the industry's first integrated Total Pool Chemistry and chlorination system lets pool owners work less and play more. The Aqua Rite Pro automatically senses chlorine and pH levels then dispenses a self-renewing supply of fresh, pure chlorine while controlling pH. For pools with the most consistent water quality possible, water that's brilliant, soft and silky-smooth. 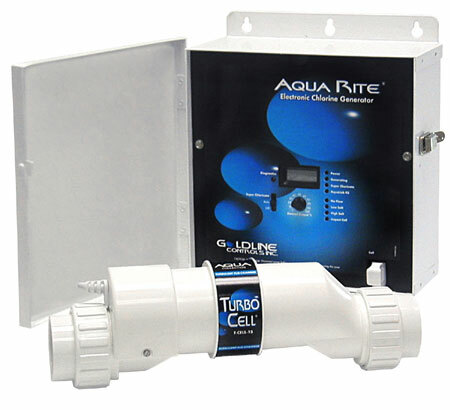 The Aqua Rite Electronic Chlorine Generator for in ground swimming pools. Creates its own chlorine from salt. The Aqua Rite keeps the water clean, soft, and inviting, without the red irritated eyes, itchy skin or chlorine smell. With an Aqua Rite there is no more buying, mixing or storing chlorine, and think of the money you'll save. The Aqua Trol Electronic Chlorine Generator for above ground pools lets you enjoy the benefits of soft, luxurious water, clean water at an affordable price. The Aqua Trol is specifically designed for an above ground pool and includes a time clock to control your filter pump. The Aqua Trol can be installed in less than 30 minutes. With an Aqua Trol there is no more buying, mixing or storing chlorine, and think of the money you'll save.